A painting by Henry Klein in the current exhibiton at Greylock Arts. People seemed surprised earlier this year when we announced our plans for our first exhibit of the season. "A landscape show?" they asked incredulously, perhaps expecting something with LEDs and photovoltaic strips instead. But, Matthew and I are interested in the intersection of art and technology, and that can take many forms. been drawn to the work of local artists, many of whom are similarly inspired by the environment around them. And so, we looked to find a way to explore the surrounding landscape using technology to enhance our understanding of it. The result? 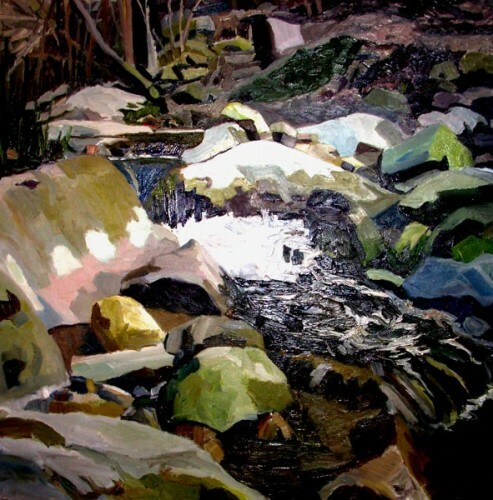 "Being There: A Geocoded Landscape", an exhibition of paintings, photographs, and other location based works by Berkshire artists all geocoded and mapped. Geocoding is a process in which geographic coordinates (latitude and longitude) are identified for a particular item or location. In addition to using geographic identifiers to map data, one can also geocode media -- for example, where a photograph was taken -- or anything that has a geographic component. information. As a professional web developer, he has worked with international environmental groups developing online mapping systems that allow individuals to browse location-based articles relating to climate change, endangered species and the work being done to protect them in particular areas. As an artist, Matthew has developed collective storytelling repositories, like Disappearing Places, which allow individuals to upload photos and stories relating to places that no longer exist. And so, it is with this interest that we took to curating our current exhibit. The second installation is "Wal-Scape" by Greylock Arts co-director Matthew Belanger. Matthew is a native of Arkansas, the birthplace of Wal-Mart, and his past video and photography work has explored themes involving these massive retail spaces. In his first installation, Belanger creates an immense landscape from fake flowers and plants, toys, cardboard boxes, bubble wrap, a television, plastic bags and more, all purchased from our local Wal-Mart. Using the GPS coordinates of the North Adams Wal-Mart, Wal-Scape attempts to restore the landscape that has been removed with the materials now found at that location and call into question our value of manufactured goods over nature. photographs by Jane Hudson in a series entitled MEMENTO. When Hudson moved to the Berkshires, she resumed an old love of photography. She writes, "The combination of majestic landscapes and derelict architecture spoke to her of both the strengths and lost pride of the area. In her treatment of images in 'sepia' she hopesto reconnect with something lost but still remembered in the 'bones'of the images. The vintage frames also lend a note of authenticity to the subjects." The images, "Friends Meeting House", "HoosicCotton Mill", and "Clarksburg Cathedral", are beautiful, regal and imposing. "Stafford Hill Monument". In these works, Canavino uses a unique light-painting technique to create and illuminate these mysterious and stunning works. that into a painting of extraordinary beauty. Painter Martha Denmead Rose also created three paintings specifically for this exhibit. As a painter, Denmead Rose carefully captures space and northern light and this obsession has taken her from Scandinavia to her native Pine Barrens of Southern New Jersey. Rose's passion for light and color is evident in the exquisite works presented here: "Pelham Lake", "Mohawk Trail Cabins", and "Stamford Valley". The Greylock Glen is panoramically captured by Adams native Mary Ann Wojtaszek. Over a 10-year period Wojtaszek was drawn to the beauty of the Glen and found herself there nearly every afternoon and took hundreds of photographs of it. For this exhibition, we selected twelve images that capture the splendor of the Glen throughout the seasons. Photographer John Lisee presents works from his series "Decline of anAmerican Mill Town: A Work in Progress." Over the years, Lisee has "created detailed images from crumbling vacant mills, decaying vehicles and darkened interiors of neglected schools with the intent to create a fine art print that will make the viewer observe things differently; to see objects that they encounter every day but tend to ignore and to appreciate their intricate detail and unusual beauty." The seven photographs exhibited here present to us the striking and stark beauty of these artifacts. "Leave Us Some Art (A Geocache)". Anita introduced me to geocachingduring a recent visit to Adams. Geocaching is an international outdoor treasure hunt game in which participants hide and seek containers (or "geocaches") through GPS coordinates. Today, over 650,000 "caches" are registered on various sites devoted to the game. On that sunny October afternoon, we found ourselves exploring parts of Adams I didn't know existed and it was inspirational. As a result, for this exhibition we decided to invert the concept. We have created a collective art cache that we are hiding in Adams as a permanent installation. The cache invites individuals to leave a drawing, collage, haiku or writing as part of the log book. All works in this exhibit have been geocoded and placed on a map that can be found at our website: www.greylockarts.net. If you have a GPS device, you can enter the coordinates of any work and visit the location where it was created. Being There: A Geocoded Landscape runs May 22nd Â– June 28. Greylock Arts is located at 93 Summer Street, Adams MA. It is free and open to the public Tuesday-Saturday 12-5 pm.